Please join James Abraham from Empired this month where he presents to us on Live Assist for Dynamics. Live Assist for Dynamics provides live chat, video calling, co-browse and much more to your case management solution on Dynamics 365 Customer Engagement. 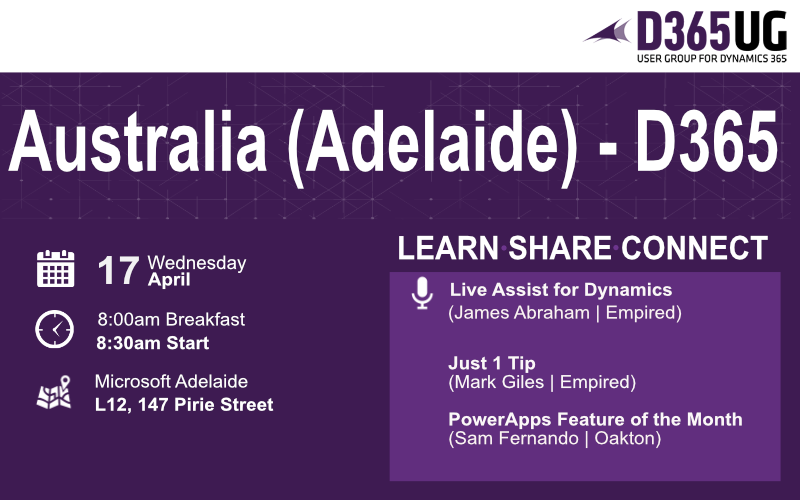 Register and attend this month’s Dynamics User Group in Adelaide to see how Live Assist can enhance the experience for your customers. We've also got Mark Giles (Empired) & Sam Fernando (Oakton) who will give us some tips on Customer Engagement and PowerApps/Power Platform. If you have any ideas or suggestions please let us know in the Discussion Area. Please feel free to forward this to your colleagues, customers or any other person who might be interested in hearing about the latest trends and developments in the Dynamics world. You could also invite others through Meetup if you are an existing member. Membership is free and become a member today to receive latest updates and news about the Adelaide Dynamics 365 User Group.